This simple amplifier shows the LM386 in a high-gain configuration (A = 200). For a maximum gain of only 20, leave out the 10 uF connected from pin 1 to pin 8. Maximum gains between 20 and 200 may be realized by adding a selected resistor in series with the same 10 uF capacitor. The 10k potentiometer will give the amplifier a variable gain from zero up to that maximum. I've moved this circuit to Area 50 as it's a bit experimental. The 2sk117 is from the "BL" Idss current range and is selected for an Idss near 7 mA. The drain resistor is adjusted to achieve about 4 volts on the drain and the value depends on the Idss of the JFET. Most of the resistors aren't critical, but precision values are shown because the resistors should be metal film types for best noise performance. Approximate DC voltages are shown for helping with resistor selection. Deviating from the shown voltages will reduce the available output voltage swing, but the amplifier might work fine for smaller signals. Unloaded swing should be about 6 volts, p-p with about 60 mV p-p input, before distortion is observed. The MPSA18 acts as a noise filter. High gain is desirable here to keep the value of the base filter capacitor reasonable, but a 2N4401 could be substituted by reducing the 10k and 120k by a factor of 5. The filter will still be rolling off the noise voltage from the 15 volts supply above about 0.2 Hz. But some power supplies can be really noisy! The 0.1 uF capacitors serve as bypass capacitors but mainly as terminals for holding the components. These are the white rectangles seen in the photo. The feedback resistor is selected for a gain of exactly 100 and the value is well above the expected 1k, due to the limited open-loop gain of the simple circuit. A small resistor is included in series with the output for stability and that resistor can reduce the gain a bit when driving a lower resistance load. The designer may choose to set the gain for that particular load, say 75 ohms, or for a high impedance load. The circuit can drive a lower resistance than 100 ohms, but the swing will be somewhat limited. It may be possible to leave out the 33 ohm resistor without stability issues. (Usually, such a utility amplifier is driving a much higher resistance load, typically 600 ohms or above.) Note: To give you an idea of how you can play with the output resistance, I just changed my unit's series output resistor to 55 ohms and adjusted the gain for 35 dB when driving 75 ohm loads. Unloaded the gain is exactly 5 dB higher at 40 dB. This way I have even number gains whether driving a 75 ohm instrument or a high-Z device. The output buffer has no trouble driving the total 125 ohm load, with a swing limit of about 3.5 volts, p-p. The output stage is an unusual self-biasing arrangement where the PNP holds the gate-source voltage near 0.6 volts, running the JFET somewhat below its Idss. The 2N5486 was chosen to not waste too much current, but a higher Idss JFET will give more drive capability, if desired. Output Impedance: 36 ohms, set by series resistor plus about 3 ohms from the circuit. My 55 ohm resistor mentioned above gives an output Z of about 58 ohms and exactly 5 dB of gain loss from no load to 75 ohms. Output voltage swing: 6 volts p-p into a high impedance load. Gain: 100 (40 dB) set by feedback resistor. Lower gain could be selected for wider bandwidth. Frequency Response: flat from below 1 Hz to above 2 MHz. 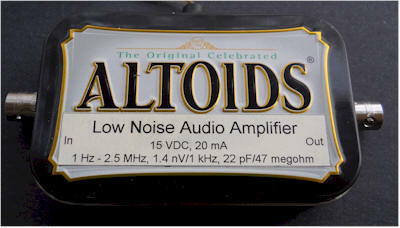 Input Noise: 1.4 nV, rising to 2.7 nV at 10 Hz. Noise current has eluded measurement so far, but it's really low. With a 97.3 k resistor (100k in parallel with 3.6 meg) connected across the input, the noise voltage measures within a tiny fraction of a dB of 40 nV, so little to no noise current is seen. In fact, this amp and a selected resistor make an inherently accurate noise source. Connect a 152k across the input (in a shielded box), and you have a precise 5 uV/root-Hz noise source throughout the audio spectrum (50 nV times 100). A quick measurement at 40 Hz gives 770 nV/root-Hz with nothing connected; the 47 megohm is expected to contribute 867 nV. That's pretty close and still little noise current from the FET. For even better performance, the bipolar stages could be replaced with a low noise op-amp. The input noise would drop a little, perhaps to 1 nV, as would the input capacitance, perhaps below 10 pf. Compensating the op-amp might be a bit of a challenge. 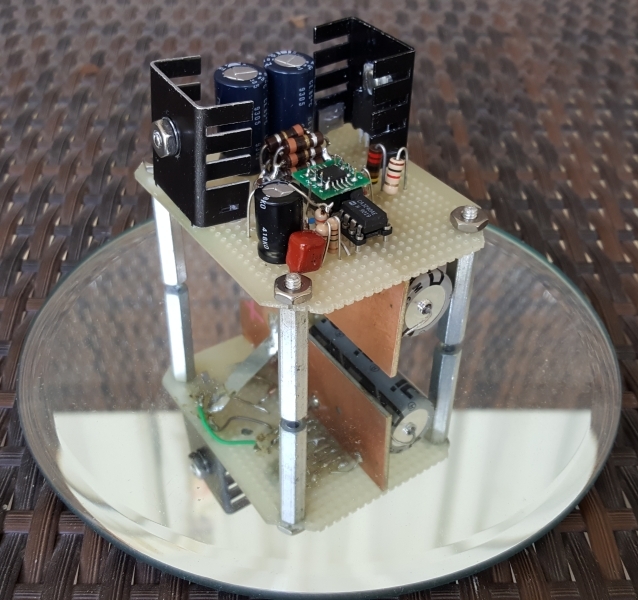 Here is a simple amplifier for boosting the audio level from low-power sound cards or other audio sources driving small speakers like toys or small transistor radios. 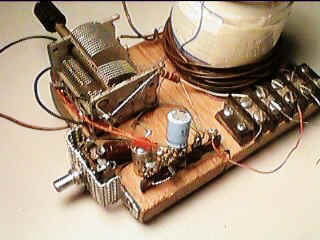 The circuit will deliver about 2 watts as shown. The parts are not critical and substitutions will usually work. The two 2.2 ohm resistors may be replaced with one 3.9 ohm resistor in either emitter. The circuit above shows a 4-transistor utility amplifier suitable for a variety of projects including receivers, intercoms, microphones, telephone pick-up coils, and general audio monitoring. The amplifier has a power isolation circuit and bandwidth limiting to reduce oscillations and "motorboating". The values are not particularly critical and modest deviations from the indicated values will not significantly degrade the performance. Three cell battery packs giving about 4.5 volts are recommended for most transformerless audio amplifiers driving small 8 ohm speakers. The battery life will be considerably longer than a 9 volt rectangular battery and the cell resistance will remain lower over the life of the battery resulting in less distortion and stability problems. The amplifier may be modified to work with a 9 volt battery if desired by moving the output transistors' bias point. Lowering the 33k resistor connected from the second transistor's base to ground to about 10k will move the voltage on the output electrolytic capacitor to about 1/2 the supply voltage. This bias change gives more signal swing before clipping occurs and this change is not necessary if the volume is adequate. As before, the two 4.7 ohm resistors may be replaced with a single 10 ohm resistor in series with either emitter. The above circuit is a versatile audio amplifier employing a low cost LM358 op-amp. The differential inputs give the amplifier excellent immunity to common-mode signals which are a common cause of amplifier instability. The dotted ground connection represents the wiring in a typical project illustrating how the ground sensing input can be connected to the ground at the source of the audio instead of at the amplifier where high currents are present. If the source is a power supply referenced signal then one of the amplifier inputs is connected to the positive supply. For example, an NPN common-emitter preamplifier may be added for very high gain and by connecting the differential inputs across the collector resistor instead of from collector to ground, destabilizing feedback via the power supply is greatly reduced. By the way, the LM358 is a fairly poor audio amplifier and you may wish to switch to a better part for reduced distortion. Frankly, for a little bench amplifier, you'll never notice the distortion. 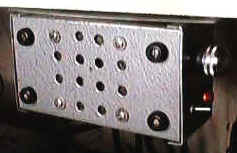 My utility amplifier was built into an aluminum Bud box and eventually ended up bolted to the bottom of a shelf as shown. The well-behaved and ready-to-go amplifier is really handy. Here is a simple audio amplifier using a TL431 shunt regulator. The amplifier will provide room-filling volume from an ordinary crystal radio outfitted with a long-wire antenna and good ground. The circuitry of such a radio is similar in complexity to a simple one-transistor radio but the performance is superior (with the exception of the amazing one-transistor reflex ). The TL431 is available in a TO-92 package and it looks like an ordinary transistor so your hobbyist friends will be impressed by the volume you are getting with only one transistor and the amplifier may be used for other projects, too. Higher impedance headphones and speakers may also be used. An earphone from an old telephone will give ear-splitting volume and great sensitivity! The 68 ohm resistor may be increased to several hundred ohms when using high impedance earphones to save battery power. 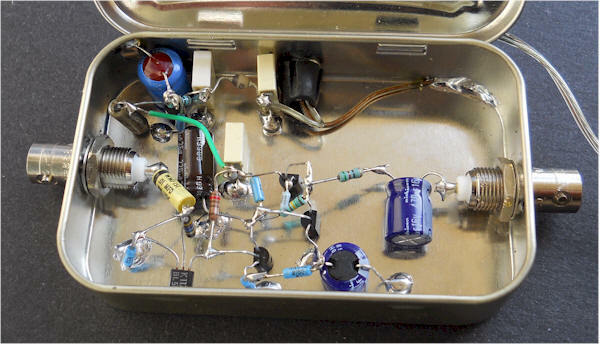 Here is the amplifier used to boost the output from a simple crystal radio. The volume control is at the bottom left and the other components are on the terminal strip at the bottom of the picture. This is a really quick and easy audio amplifier! This circuit and the following aren't for beginners; they are of limited usefulness and require an understanding of the underlying principles and potential applications. They all pass DC through the speaker which is wasteful and can cause problems for the inexperienced builder. If built without variation, they should perform as described but make sure to read the text. The 5 volts should be provided by a regulated power supply. The efficiency is below 25% and significant DC current flows in the speaker and that additional power should be figured in to the power rating of the speaker. But look how simple it is! The voltage gain is only about 20 and the input impedance is about 12k. The schematic shows two values of bias resistor to be used with the corresponding speaker impedance. With the 150k bias resistor and 8 ohm speaker, the circuit draws about 210mA (1 watt) and can deliver about 250 mW to the speaker which is plenty of volume for most small projects. The speaker should be rated at 500 mW or more and should exhibit a DC resistance near 8 ohms (perhaps 7 ohms). Check the candidate speaker with an ohmmeter; much below 7 ohms will cause excessive current draw. With the 220k resistor and 16 ohm speaker, the circuit draws about 100 mA (500 mW) and delivers about 125 mW to the speaker. The 16 ohms speaker should be rated at 200 mW or more and exhibit nearly 16 ohms of DC resistance. (Most small speakers have a DC resistance near the rated impedance and that resistance is used to set the quiescent current level in this circuit.) Other NPN darlington transistors will work but choose one that can dissipate 1 watt minimum. Most power types don't need a heatsink but tiny TO92's might overheat. The input impedance is about 5000 ohms and the frequency response is flat from 30 Hz to over 20,000 Hz. With the 8 ohm speaker the current drain is about 215 mA and the gain is about 1700 (64 dB). With the 16 ohm speaker the current gain is about 110 mA and the gain is about 2500 (68 dB). A volume control may be added by connecting one end of a 5k potentiometer to ground, the wiper to the amplifier input. The other end of the pot becomes the input. It is a modulated light sender! Connect the input to an audio source or microphone (a speaker will work) and the audio will amplitude modulate the light intensity. The inefficiency of the class-A works in our favor now, lighting the lamp to mid-brightness with no audio present. Actually, with a 4.7 volt bulb, the lamp will be near full brightness and will be "overdriven" on sound peaks. A higher voltage bulb will last longer but will be dimmer. Try a 6.8 volt bulb as a compromise. With a sensitive detector like a phototransistor, this communicator will work several hundred feet (at night). Best range is realized if the bulb is mounted in a typical flashlight reflector and the detector is similarly mounted. The input capacitor is reduced to .01 uF to give the amplifier a high-pass character to compensate for the slow response of the bulb. The audio will sound a bit muffled, anyway. The clever designer could use this amplifier for the receiver, too, switching the speaker to the input for transmitting and to the output for listening. If you choose a detector with good infrared response, like a pin photo diode, you can add plastic IR filters to block out ambient light and make the communicator harder to see at night.